What Color is Your Purple? 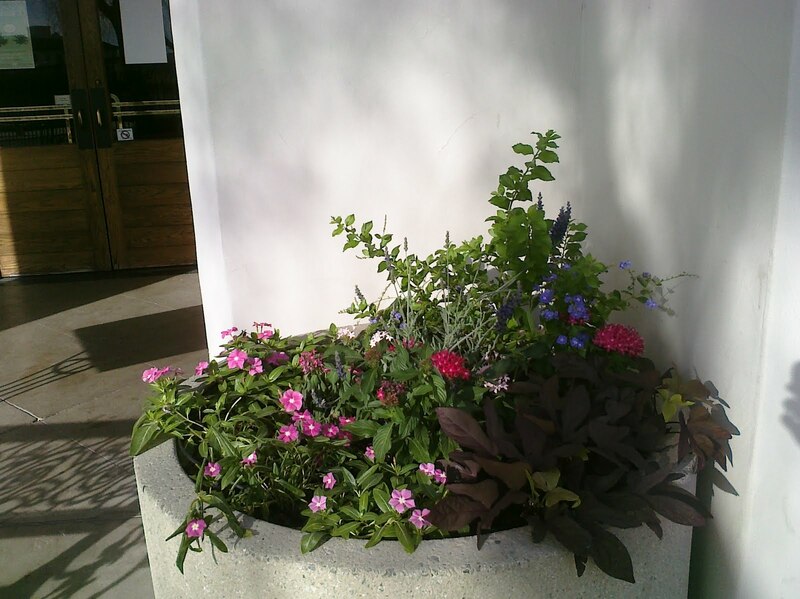 It is interesting to see how people prefer their colors together when combining flowers in a pot. 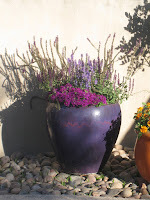 I have a purple pot at home and plant purple flowers in it each season. This year, I combined red purples with blue purples and I am deciding what I think. 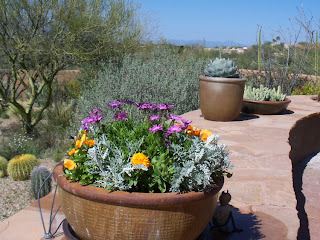 Since the pot is viewed from a distance of 30-60 feet, depending on where you are in the yard, I think it works. What do you think? Save Money – Get your questions answered before the dead plant has to go into the compost heap! Well – the sale is over and a good one too! We probably gave out twice as many answers to questions as plants we sold! I overheard Catherine telling some of our customers that they can always email or call us with questions – and that is what I want you to remember. IF you are not sure – email me your questions. If we don’t have the answers we can help you get them but we often will help you from tossing your money into the compost heap. Have a great holiday weekend Happy Memorial Day – let’s take a moment to remember all that have served our country and continue to keep us safe and free. Don’t let your pots go empty all summer. There is still plenty of time to plant everything!! You deserve it so put it at the top of your list – NOW!! Check out this planting at Maynards that we did before Easter. When you go - check out the growth. Do you know that 5 minutes of gardening improves both self-esteem and mood as well as making you feel more tranquil, generous and hopeful*? To me this is both surprising and makes so much sense. I know when I go out to tend my potted garden in my back yard, I quickly feel better than before I went outside and wonder why I don’t get out there more often. And as the eternal optimist, maybe all my gardens have given me more reason to be hopeful, even in our challenging economic times! 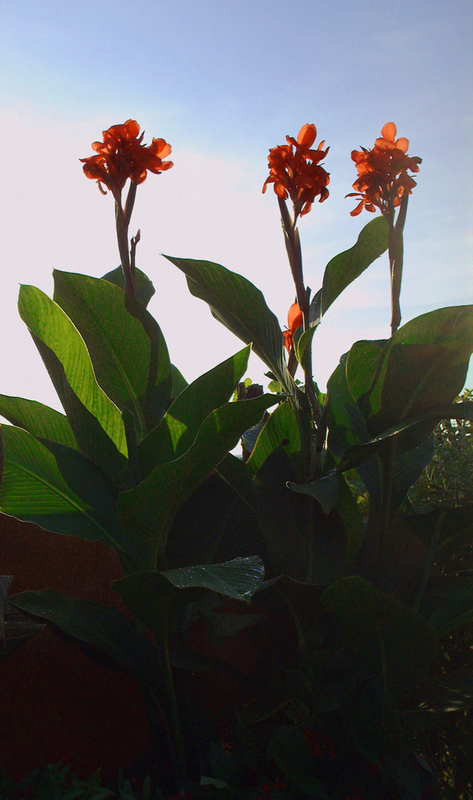 Give it a try – go outside and if your garden is one plant or 100, spend 5 minutes tending them and see how you feel. Take a break during your day and I bet you that you will come back inside energized and ready to go! 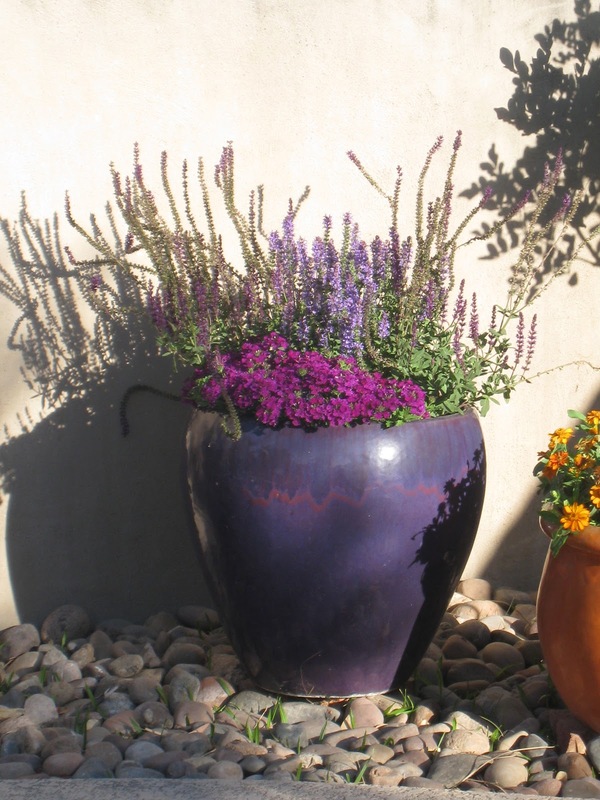 Free Potted Landscape classes this Saturday! Not one, but two FREE classes by yours truly, Marylee, The Contained Gardener. 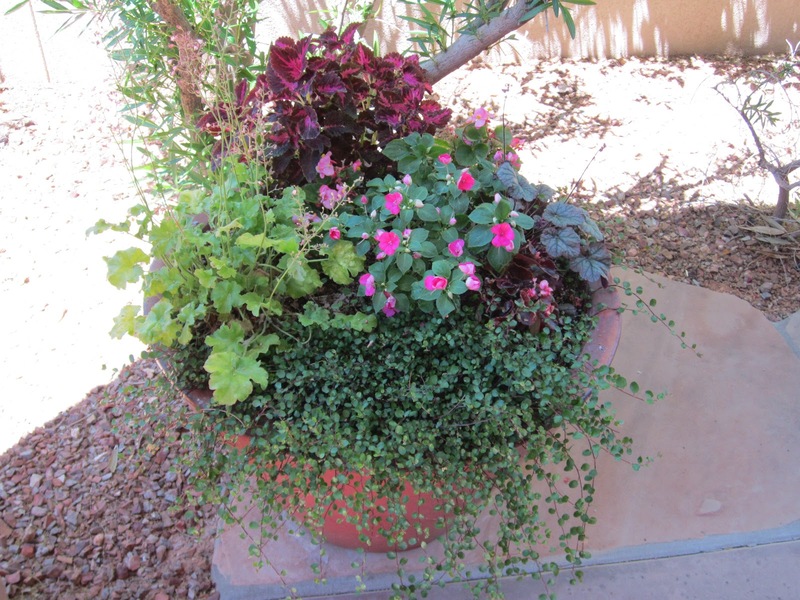 Sat, May 21 at 9am will be Potted Garden TLC – “Getting Started in your Potted Landscape.” Now is the perfect time to start your garden ~ yes – even in the summer in Tucson! Immediately following at 10:30 am is “Planning and Maintaining your Potted Landscape Irrigation System” Marylee will help to demystify your irrigation woes when it comes to pots in your landscape. Registration is required. Go online to http://www.thecontainedgardener.com/classschedule.html to register. Both classes are held in our air-conditioned Design Studio at 2522 E Ft Lowell Rd. Just east of Tucson Blvd, across from Zona Fountains. If you need more information, call 733-3359 and leave a message for me! Yesterday I mentioned Lowe’s insert in the paper. They also had a little article about geraniums. The information is complete – with one caution for Tucson’s summer climate. Geraniums in the summer should not receive more than a couple hours of early morning sun. It is best if they have an eastern exposure moving into shade by 9am or so. 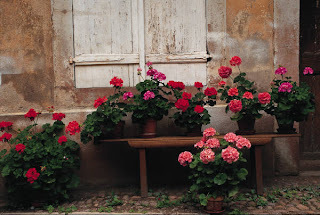 We also expect our geraniums to ‘brown out’ by late July and August. When this happens, cut them back to their lowest point and either shade them or plant some flowers around them to provide a natural shade. You will be rewarded by having fresh wonderful plants in the early fall. Be sure to let them dry somewhat between waterings as they don’t like their feet constantly wet!! This week in my garden I removed two seemingly dead Mexican Lime trees. They had ‘suckers’ coming up from the root stock but the limbs were gone. Since the root stock will not bear good fruit, I decided to give up. My grapefruit tree, however is still giving me mixed messages so I am going to be even more patient and wait it out. I have given it some extra drinks of water and will fertilize it again this month. Stay tuned and we will see if it honors me with growth this spring! I have my own philosophy about the freeze. The plants that made it through are giving us a real show of color this spring – roses especially!! See this picture of one of our client’s roses. What a treat for our field technicians to go out and care for these gardens and be rewarded with this kind of bloom! And it is not just the roses – many other plants have given us great color and scents that just fill our senses with delight!